Walking to school just got easier for students and families in Deschutes, Crook, Jefferson and northern Klamath counties through a new Walking School Bus program headed up by Commute Options. A Walking School Bus is an organized group of children who walk to school together with one or more adults. Much like a school bus, as the students walk towards the school, they pick up more classmates along the way. In 1969, 48 percent of children aged 5 to 14 usually walked or biked to school. Today that number is as low as 13 percent. Research also shows that the health care costs in the United States for childhood obesity alone are estimated to be a staggering $14 billion per year. Health professionals across the country all agree that our children’s health is a top priority. As kids become more sedentary, they are at higher risk of obesity related diseases such as cardiovascular disease and diabetes. Children need a minimum of sixty minutes a day of physical activity, and walking to and from school is an excellent way to weave that activity into daily life. Walking School Buses help increase that necessary physical activity while also improving safety near schools, helping parents with time management, and reducing traffic congestion near schools. Kids can spend more time outside (and less time looking at a device! ), more time in their neighborhood, and less time in a car. Children who walk or bike to school are healthier, happier, often do better in school and they are also more likely to become healthy, active adults. Many Walking School Bus programs also report an added benefit of their neighborhood coming together to build community around the safety of children. Volunteer Walking School Bus leaders can include parents, teachers, high school students, seniors, business owners and elected officials, bringing people together for one goal – getting kids to and from school safely. 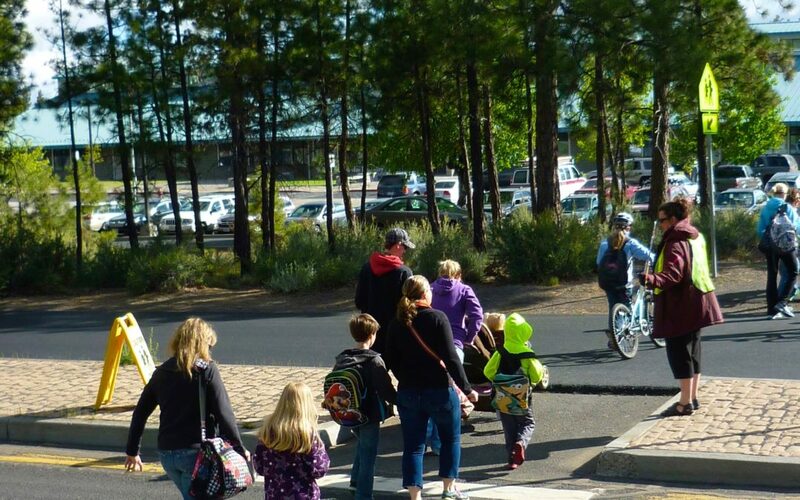 The Walking School Bus program is funded through a grant from the Central Oregon Health Council’s Regional Health Improvement Plan Cardiovascular Disease and Diabetes Prevention Workgroup. Commute Options is actively looking for interested neighborhoods, schools and volunteers to get started with the Walking School Bus program. Contact Kersey Marion for more information. Promoting choices that reduce the impacts of driving alone. For more information, contact Executive Director, Jeff Monson at 541-330-2647 or visit www.commuteoptions.org. Katy Bryce is a freelance writer in Bend. www.katybryce.com.